We have all watched Alice in wonderland, an innocent girl who goes through the rabbit hole to a whole one world filled with strange creatures, it was a family movie. This game, Alaxe in Zombieland on the other hand, is only for adults, it will invite players to join Alaxe as she takes a trip to Zombie land where every creature is a zombie of some sort. Players will notice the dark theme of the game as soon as the game loads with the black background and the scary symbols that appear for players on the reels of the game. 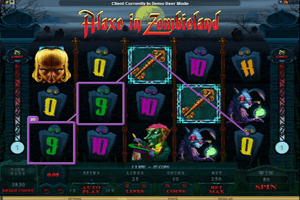 Play Alaxe in Zombieland Slot here. The game has five reels on which players can find the lines that they can place their wagers on. These wagers can be placed straight at the bottom of the screen. They will choose the number of paylines, the value of the coins and the number of these coins on each activated payline. The brain symbol is the wild icon of the game that players can rely on to form winning combos. This wild symbol achieves that by substituting for any of the other icons that appear on the reels of the game. When a wild icon substitutes for other icons and forms a winning combo, it will double the payout. The game has three scatter symbols, the key, the watch and the mysterious item. They can trigger the Tea Party free spins round through which players can earn great payouts.